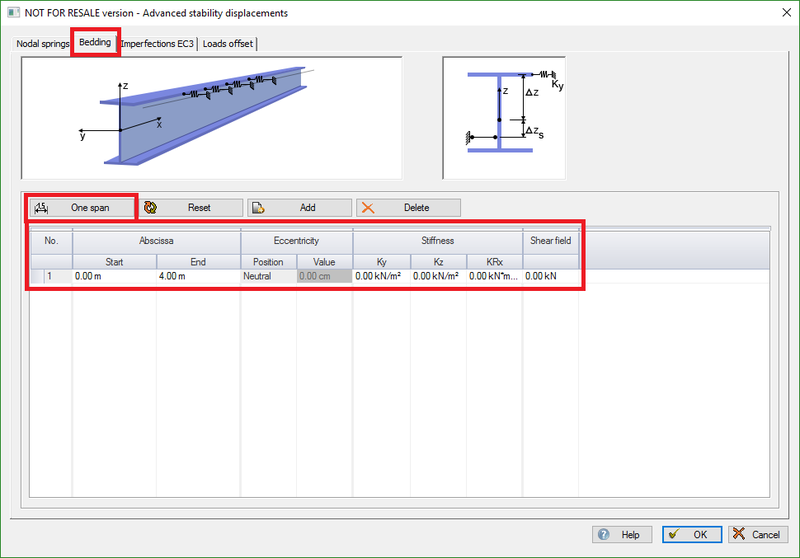 After a steel member is set to be designed using the Advance Stability solver from Advance Design Bedding conditions can be imposed in the definition box. The Bedding tab allows the user to define continuous springs along the member, in case of steel sheets (shear diaphragms) acting as restraint, for example. By default, the “Bedding” option is not activated. In order to activate it, the “One Span” function auto-detects the intersections of the selected element with other elements (like it does in the Nodal Springs tab). The bedding conditions can be added, deleted or reset. The bedding “Position” is by default set to “Neutral” (in the shear center of the section), but it can also be modified by the user along the Z axis and set to “Upper fiber”, “Lower fiber”. It can also have an value imposed by the user, which can be set as reported to the neutral point. Shear diaphragms originate, for example, if trapezoidal steel sheeting or similar components are continuously connected with the construction underneath at all four edges. Often, the compressed upper flange of girders is considered to be supported laterally in this way. The supporting effect does not rely on a disability of displacement as is the case with translational springs, but on a decrease of rotations.